Atheneum Books for Young Readers, 9781416961451, 320pp. For many readers, Forge “will be one of the best novels they have ever read” (starred review from Kirkus Reviews)! Blistering winds. Bitter cold. And the hope of a new future. In this compelling sequel to Chains, a National Book Award Finalist and winner of the Scott O’Dell Award for Historical Fiction, acclaimed author Laurie Halse Anderson shifts perspective from Isabel to Curzon and brings to the page the tale of what it takes for runaway slaves to forge their own paths in a world of obstacles—and in the midst of the American Revolution. The Patriot Army was shaped and strengthened by the desperate circumstances of the Valley Forge winter. This is where Curzon the boy becomes Curzon the young man. In addition to the hardships of soldiering, he lives with the fear of discovery, for he is an escaped slave passing for free. And then there is Isabel, who is also at Valley Forge—against her will. She and Curzon have to sort out the tangled threads of their friendship while figuring out what stands between the two of them and true freedom. Oct 2010. 304 p. Atheneum, hardcover, $16.99. (9781416961444). Anderson follows her searing, multi-award-winning novel Chains (2008) with this well-researched sequel, also set during the Revolutionary War and narrated by a young African American. This time, though, her central character is male, and the heartbreaking drama shifts from Chains’ domestic town houses to graphically described bloody battlefields. After a narrowly successful escape from Manhattan, former slaves Isabel and Curzon separate, and Curzon is once again on the run. He finds necessary food and shelter as a private with the Continental army, and through Curzon’s eyes, Anderson re-creates pivotal historical scenes, including the desperate conditions at Valley Forge. Curzon isn’t as fully realized here as Isabel was in Chains, resulting in a less-cohesive and -compelling whole. Once again, though, Anderson’s detailed story creates a cinematic sense of history while raising crucial questions about racism, the ethics of war, and the hypocrisies that underlie our country’s founding definitions of freedom. Chapter heads excerpted from historical documents and a long appendix that offers research suggestions and separates fact and fiction add further curricular appeal. Intermediate, Middle School Atheneum 297 pp. When Laurie Halse Anderson's novel CHAINS was published in 2008, it became a finalist for the National Book Award and won the Scott O'Dell Award for Historical Fiction. The book introduced young people to an important --- and often overlooked --- chapter in American history, as Anderson told the story of the dawn of the American Revolution through the eyes of a young slave girl. Anderson now continues this work in FORGE, the second book of what will eventually be a trilogy. Here the narrative shifts gears from Isabel to her friend Curzon, a fellow runaway who becomes separated from Isabel but finds safety --- of a sort --- when he enlists as a soldier fighting on the American side during the Revolutionary War. As one of the few black soldiers, he is disrespected --- and worse --- by some of his peers and his officers. With his customary courage, hard work and loyalty, however, Curzon gains the respect and even the friendship of many of his fellow soldiers. All the young men's fortitude is brutally tested, however, when they are told to report to Valley Forge, Pennsylvania, during the winter of 1777 and 1778. As Curzon and his comrades struggle just to survive, Anderson vividly brings to life the horrifying details of life in Valley Forge, unflinchingly documenting the hardships that most high school history books just gloss over. From surviving days without food to digging trenches in frozen ground to trudging through snowdrifts in just a pair of wet, stinking socks, Curzon's story, and that of all the men, will both repulse readers and remind them of the soldiers' remarkable fortitude and bravery. 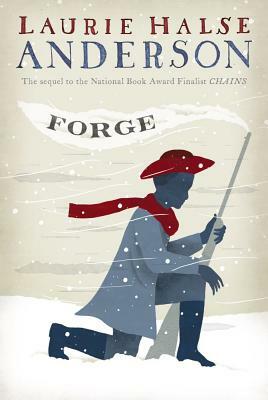 Besides being a compelling, unfailingly realistic account of the winter at Valley Forge, though, FORGE's story also serves as a powerful metaphor: "This camp is a forge for the army," remarks one character. "It's testing our qualities. Instead of heat and hammer, our trials are cold and hunger. Question is, what are we made of?" What indeed? Curzon finds himself asking this question and others when his past as a runaway slave starts to catch up with him. By all accounts, he should be freed; he has kept his part of a bargain that he made months earlier. But he doesn't have paperwork showing he's been freed, and if he's revealed as a runaway, hunger and cold will be the least of his problems. One beloved but complicated relationship from his past also resurfaces when he encounters Isabel once more and must deal not only with their shared and separate histories but also with his evolving feelings toward her. Once again, in FORGE, Laurie Halse Anderson has managed to compose a historical novel that feels both entirely true to its period and completely contemporary. Curzon's voice rings true as that of an 18th-century young man, but its sophisticated narration and storytelling style introduce contemporary perspectives seamlessly in ways that will not only allow readers to reflect on their own times but also to reconsider their understanding of and approach to history. With its extensive historical notes and glossary, FORGE (like CHAINS) would be an ideal classroom companion to more traditional history-book fare, one that readers will likely relish as much for its sensitive storytelling as for its gutsy depictions. Forge is the sequel to Chains (2008), but it can be read independently. Anderson has done her research and accurately portrays the horrors of serving in the first Continental Army at Valley Forge. The story within is of slavery in a fledgling nation; the freedom that the founding fathers were fighting for did not extend to their slaves. The hero of the story, Curzon, has already served in the army, but in trying to get away from a cruel master, he is re-enlisted. When his former master reappears, his friends from his squad help him escape, along with Isabel, the heroine of Chains. The book contains an appendix with glossary, further readings, and Q&A about the historical background and primary sources used. Each chapter begins with a quote pertaining to the war or slavery. While the details are accurate, the book is not gratuitously violent. Curzon is an empathetic character to whom most young people will relate. At the end, when Curzon and Isabel escape, the reader can only hope that all will end well in the next book. Laurie Halse Anderson has again written historical fiction at its finest.